Dang it anyway, I had just moved towards a hard gobbling turkey which I thought was the conversational turkey that abruptly left me to chase those four late departing hens. As gobbler and I conversed, I had missed detecting the four hens still on roost above our heads until they flew down at 7:00 yelping their way off in the opposite direction with my tom in tow. And now! I hear gobbling coming from my original setup spot. So much gobbling that surely if I had not gotten seduced into moving a beautiful turkey would be wearing my tag right now. Here I am on day 3 of my hunt during Wisconsin’s second mini-season. The morning dawned quiet and still even though the evening before I did a lot of audio baiting so I knew there would be birds nearby. From some of the treetops on the opposite ridge, I heard what I thought were feet shifting on their roost branches and the ruffle of feathers. No response to my owl hoots. Gobbling has been sparse so far this spring in spite of the beautiful weather. I setup down the ridge from the turkey sounds then around 6:00 a turkey gobbled in answer to my soft clucks. Soon the sound of a dull thud as the tom apparently just let go and fell to the ground. A series of walking clucks got him fired up gobbling and strutting as he moved towards me. As I prepared for the anticipated upcoming shot, those hens mentioned earlier sailed off their roost, and my gobbler turned in pursuit gobbling his merry way after them. Moving seemed a reasonable strategy, it always does until 20/20 hindsight takes effect, like gobbling coming from where you just left. As I called more, gobbling started up all around. A real turkey hunter’s dream morning, still, clear, mild and turkeys coming to life everywhere. Picking the correct side of the tree in anticipation of which gobbler would arrive first was my most pressing issue. The first group of 3 toms fought, strutted and picked their way along the top of the ridge to my right. The offered shots were marginal and quickly became worse when a fourth unseen turkey busted me causing all them to move out and spooking the rest of the incoming turkeys. All that action and now I’ve one more chance if I can get the left behind turkey to come in. He was hung up gobbling his head off. I moved around the to the other side of the large oak placing my back to him hoping my calls would sound like a hen giving up and walking away with the other turkeys. Turkey noise stopped, and the only thing I heard was rustling in the leaves to my right. Ever so slowly I turned my head just enough to see the tom in my peripheral vision, he was mere feet behind at 4 o’clock. 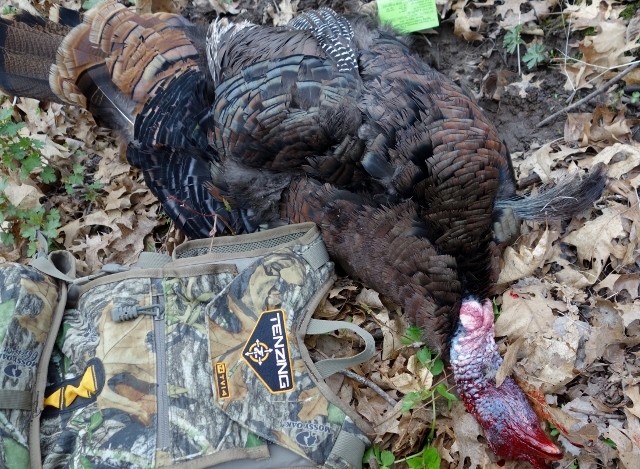 No breathing or blinking for me as he suddenly cut loose a thunderous gobble and walked past in the wide-open woods. Nothing but air between us, I dared not move as he slowly continued to amble past me. His feathers audibly rustled with each step that finally took him behind a large tree trunk out of sight. Being right handed I had to turn for the shot, gun up at the ready for the tom’s reappearance. It took forever; I started to think he’d heard me and walked straight away keeping the tree screening us. Oh No! Oh yes! His pearly white head emerges 12 yards off the end of my barrel, his eye straining to pick form out of the gnarled tree bark. My gunshot sounds as slides his neck out, beard dangling in the opening.